We came across this gorgeous DIY at Amy Atlas' website. The clay peonies were created by Diane from DK Designs who have shared her crafts on the Martha Stewart Show! Here's the instructions, enjoy! 1. 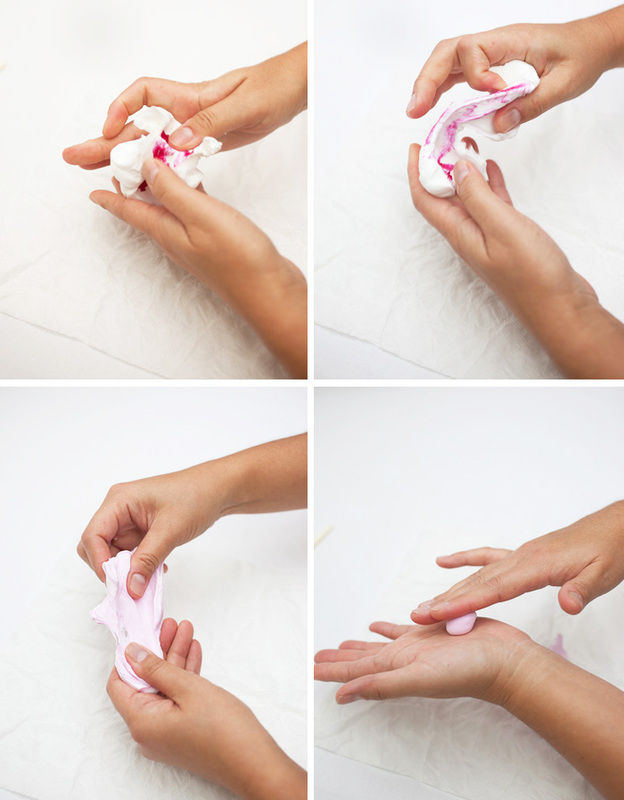 Open up a set of wet paper towels. Mix 1/3 of the package of white with a tiny amount of red clay. 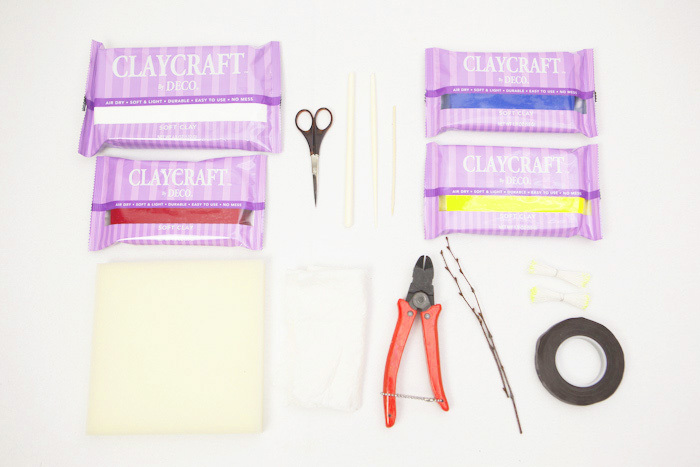 Knead the clay by pulling apart and pushing back together until the color is mixed through. Make balls 1/2 inch in diameter. 2. 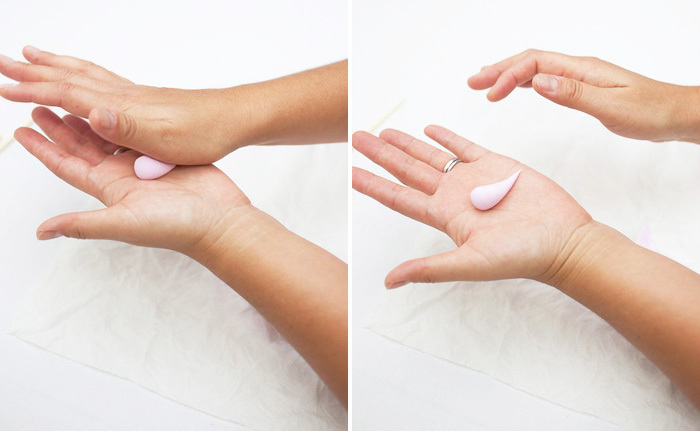 Make teardrops out of the balls using the heal of your right hand while keeping your left hand stationary to roll the teardrop shape. 3. Cut the teardrop slight off center, almost half way down lengthwise. On the fatter side, cut twice to make 3 petals and cut the other side in half. You should have a total of 5 petals. 4. With a skewer or round toothpick, roll each petal out on your index finger. 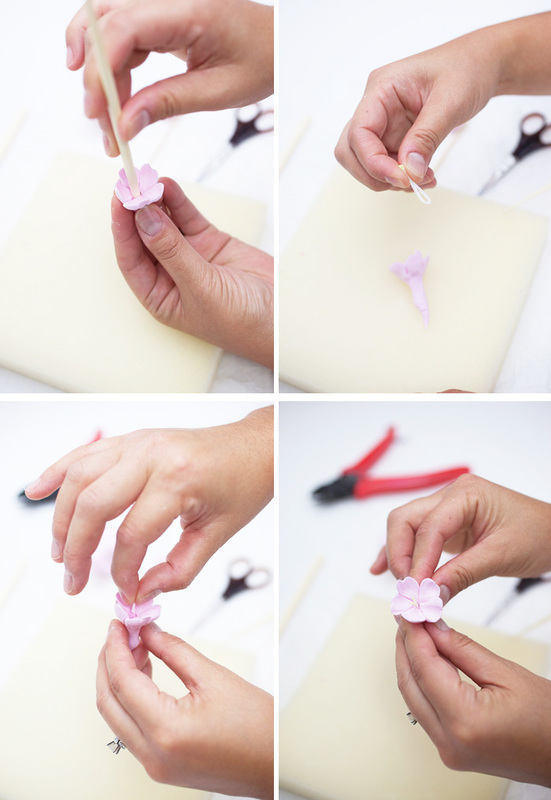 Before you roll the petal out completely, notch the petal in the middle and roll out again to create the heart shape. Do this for all five petals. 5. 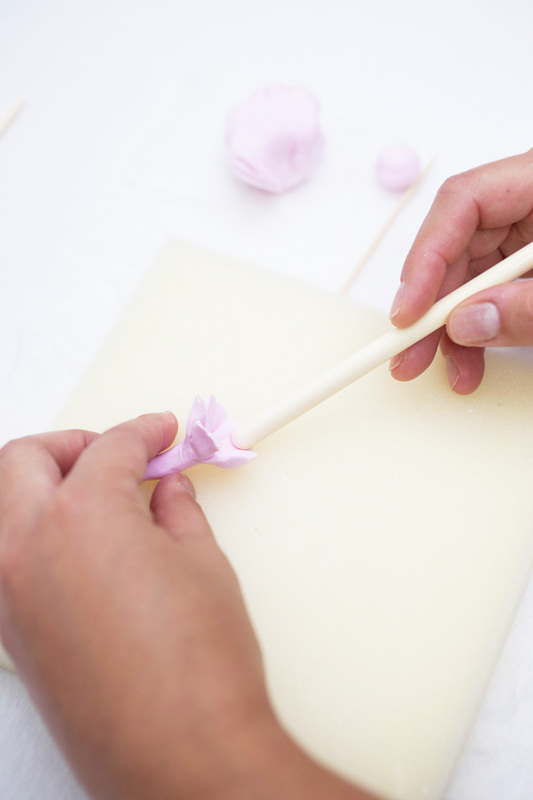 Using the fat end of the largest round detail stick, indent each petal by pusing the petal down into the soft foam, to cup each petal. You can choose not to do this step if you want your petals to be flat. 6. Place the fat end of the smaller detail stick into the center of the petals to make a hold for the stamen peps. Take about 4-5 double-ended peps, fold in half, cut off the bottom, add glue and insert into the hole. Taper the bottom of the clay to a point. 7. Apply glue to 24 or 30g wire and insert into the bottom of the flower and let dry on a piece of styrofoam for roughly 12 hours. 8. If you wish, you can paint your flowers, but it is not necessary. 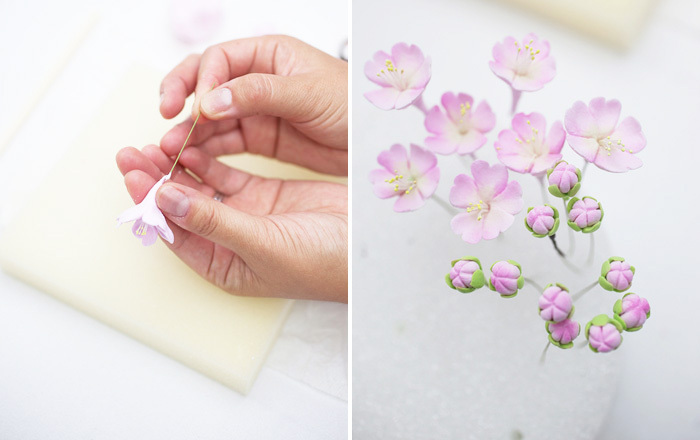 Using brown floral tape, tape the buds and flowers onto the branches in various positions. 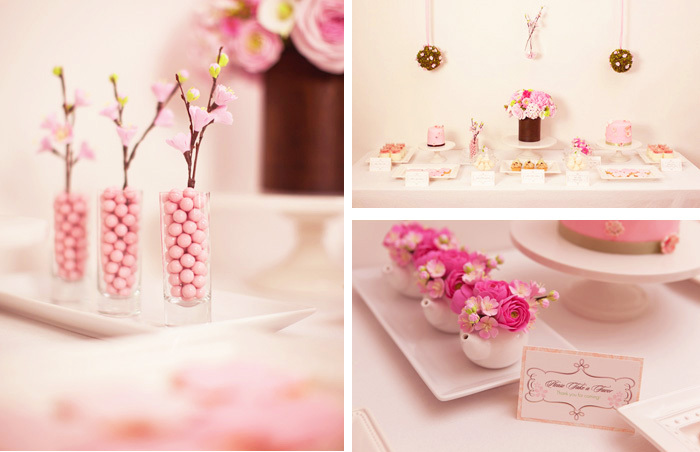 When you have achieved the desired branch look you want, simply fill your glass with your favorite candies and insert the branch.